Looted by the Nazi authorities 1940. Catalogue, Stichting Nederlands Kunstbezit, The Hague, 1946, no. 99. W. Stechow, Dutch Landscape Painting of the Seventeenth Century, London, 1966, p. 204, no. 48. C. Wright, Paintings in Dutch Museums. An Index of Oil Paintings in Public Collections in The Netherlands by Artists born before 1870, London, 1980, p. 209. Old Master Paintings: An illustrated summary catalogue, Rijksdienst Beeldende Kunst (The Netherlandish Office for the Fine Arts), The Hague, 1992, p. 158, no. 1303, illustrated. A.I. Davies, Jan van Kessel (1641-1680), Doornspijk, 1992, pp. 193-4, no. 117, illustrated. The Hague, Schilderkundig Genootschap Pulchri Studio, Catalogue de la Collection Goudstikker d'Amsterdam, November 1924, no. 60. Rotterdam, Rotterdamsche Kunstkring, Catalogue de la Collection Goudstikker d'Amsterdam, 10-25 April 1926, no. 51. Amsterdam, Kunsthandel J. Goudstikker N.V., Tentoonstelling van Hollandsche Winterlandschappen uit de 17e eeuw ten bate van het Crisis-Comite, 6-29 February 1932, no. 39, illustrated. The Hague, Kunsthandel G.J. Nieuwenhuizen-Segaar, Oude Kunst, 20 October-17 November 1934, no. 20. Gouda, Museum het Catharina Gasthuis, on loan. It was Wolgang Stechow who correctly observed that for the present composition, Jan van Kessel was influenced by his possible teacher Jan van de Capelle (Amsterdam 1626-1679) (loc. cit.). 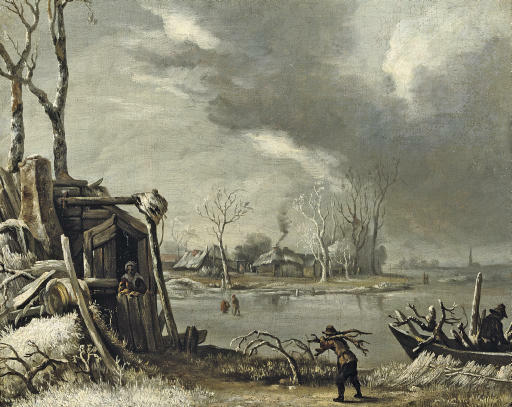 He particularly referred to van de Capelle's winter scenes of circa 1653 such as the paintings in the Mauritshuis, The Hague and in the Liechtenstein Museum, Vienna. Alice Davies further adds that the present composition '... emulates the Mauritshuis painting especially in the description of the stormy sky, snow-laced and mottled trees, and crude thatched cottages. It varies from the prototype in the use of large-scale elements in the foreground, the glossing over of the middle distance, and the unremitting greyness. Certainly he also was reacting to the 'heroic' winter landscapes emerging from Ruisdael's studio in the mid-sixties' (loc. cit. ).